Tags are keywords that you assign to content. Tagging pages to share with others is social bookmarking, and it’s very popular on the web and is easy in SharePoint. If you’ve ever used a site like Delicious, you already know how social bookmarking works. As more people assign the same tags, tags become a way to navigate to similar content. The Tags and Notes group on the Ribbon lets you type your own tag keywords, so you can mark content with terms that are meaningful to you. 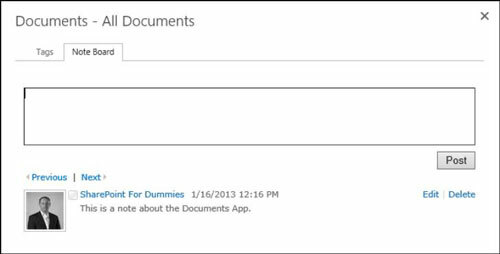 This button also lets you access the Note Board, which you can use to leave publicly viewable comments on a document or page. The emphasis is on keyword in tagging. SharePoint doesn’t prevent you from typing longer tags, but its best to use single words or very short phrases as tags. Otherwise, you defeat the purpose in using tagging as a fast, concise way to categorize information. If you need to make longer remarks, use the Note Board. Browse to the page you want to tag. To tag individual items or documents, you must browse to the app and click the row you want to tag. The Tags and Notes for individual items or documents is on the Items tab of the Ribbon. Locate the Tags and Notes group on the List or Library tab of the Ribbon to see your tagging options. Click the Tags and Notes button. The Tags and Note Board window appears populated with recent tags you’ve applied. In the My Tags text area, click an existing tag and/or type the tags you want to apply to the content. Use a semicolon to separate tags. (Optional) To mark your tags as private so others can’t see them, select the Private check box. Click the Save button to save your tags. When you save your tags, they appear in the Suggested Tags section of the page. You can click any of the tags in this section to view the Tags Profile page. Click the Note Board tab and type your note in the text box. Unlike tags, notes entered with the Note Board can’t be marked private and so are viewable by anyone else with the same access. Choose your words carefully. Click the Post button to post the note. The note appears in the window, along with any other notes that have been entered. You can scroll through all the posts entered for this content using the Next and Previous buttons. To close the window, click the X in the upper-right corner of the window.